With more than 80 years of donut-making to our name, Dixie Cream knows how to make donuts that defy comparison. 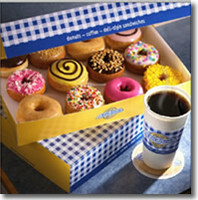 Notice that our donuts are a little taller than others. Notice, too, the golden band around the middle of a Dixie Cream. That's our promise of light and creamy melt-in-your-mouth goodness that just gets better by the bite. Q. Is there any experience necessary to own a Dixie Cream Donut restaurant? A. Yes, but not necessarily in foodservice. Dixie Cream actively searches for candidates with a strong background in business management. Q. I'm interested in a Dixie Cream Donuts franchise. What do I do next?